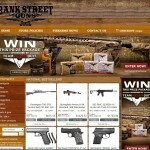 Bank Street Guns is the largest gun shop in Mohave County, Arizona. We are a locally owned and family operated (even the family dog, Brody!). 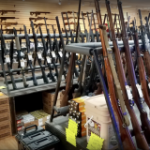 We offer a friendly atmosphere with a large selection of guns, ammunition, and accessories at very competitive prices. All of our staff members are NRA Certified Range Safety Officers and many are NRA Certified Instructors. You can shop with confidence, knowing that we are not only here to help you choose the perfect firearm, but also to help you attain the skills necessary to operate your firearms in a safe and responsible manner. 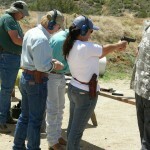 All our classes are NRA Certified. We have a variety of classes ranging from Basic Pistol and Basic Shotgun, to Personal Protection Inside and Outside the Home. We currently have 5 instructors on staff. We have the largest selection of new and used firearms in the county. We also carry the largest selection of Ammunition and accessories. At any given time, we can have over 700 guns in stock. Bank Street Guns has the only indoor shooting range in Kingman, AZ. We have a large selection of popular handguns to rent as well as full-auto machine guns. 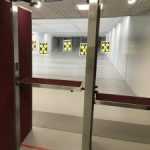 Our range is always staffed with an NRA RSO for your safety. Our Online Store has been temporarily taken offline due to allow for future upgrades. We are sorry for the inconvenience. We expect to have it back online in the near future.